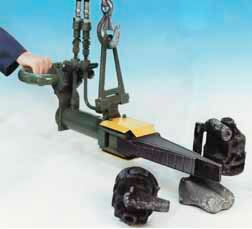 The hydraulically powered wedge breaks off risers from iron (gray or nodular) and steel castings. It does it faster, easier, and with more safety than by using hammers, saws or other tools.The wedge is easily moved to position the tip of the wedge into the space between the casting and riser. When the handle-mounted push button is pressed, the self-contained hydraulic cylinder is activated. The wedge moved forward, spreading the side plates apart. The pressure between casting and riser forces a clean break between them at the weakest point in the gate. The wedge retracts when the button is released.